I’d like to begin by saying that is by no means a definitive list of everything one should do with one’s kids in Paris, nor is it a comprehensive one. You will not, for example, find any museum here. That’s because a) you don’t need me to tell you about the Louvre or the Musée D’Orsay and b) because the day we decided to spend more of our time wandering in neighborhoods and less time standing in line crossing our fingers that the girls (ages 7 and 9) would be able to appreciate whatever it was we were waiting to see, was the day we found our vacation rhythm. So this compilation of 26 moments, walks, restaurants, bakeries, shops, cafes, strategies, and parks is merely our list. But I will say that we ended every day exhausted, satisfied, and stuffed. Don’t you think that says a lot? 1. Breakfast in the Gardens. We like routines in our house and perhaps sadly, this extends to vacation. This is how we ended up hiking up rue Monsieur Le Prince from our apartment right near the Odeon Metro station, and stopping by a small local (reasonably priced) boulanger for croissants and caffe crèmes, then heading up to the oleander-ringed fountain in Jardins Luxembourg and eating breakfast. I would say there is no more perfect way to start a day. 2. Jardin du Luxembourg We used this park so much on our 8-day stay in Paris that I found myself getting mad at tourists when they got in the way of my running route around the perimeter. As for kids, there is the playground in the southwest-ish corner which has an awesome swing-like zip line and a jungle gym tower made of rope. I’ll never forget Abby scaling it like a monkey in under a minute. Entry for the playground costs 1.5€, I think more for adults. 3. Model Boats At the fountain in Luxembourg gardens we’d rent boats for the girls (3€ for half hour) while we finished our caffe crèmes. Watching them chase their boat from our reclined chairs was like living inside a Cezanne painting for a half hour. 4. 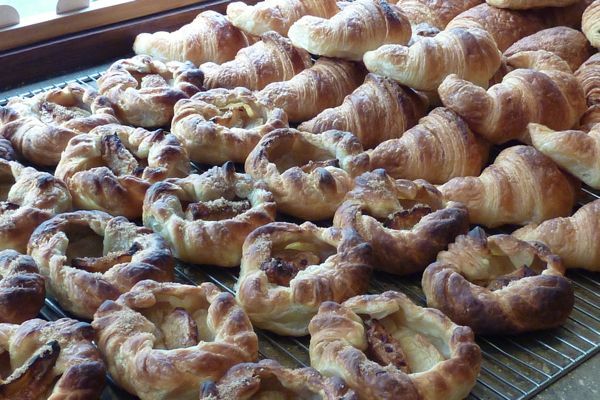 Poilane – Other than being one of the most famous bakeries in Paris — their sourdoughs are monogrammed with powdery scripted “P”s — it won the Best Croissant Award in our house. I cannot claim to know the secret, though I suspect it has something to do with the fact that when Andy squeezed one gently, we could literally see butter oozing out. 5. Monoprix Our friend David, who spent a dozen years in Paris, told me when visitors express interest in experiencing the “real Paris,” he tells them to buy frozen food at Picard (that’s what all Parisians do apparently) and to go to the Monoprix, which is like France’s answer to Target. I wasn’t psychologically prepared to bypass the market produce for the freezer section, but we did manage to hit the Monoprix (or the “Monop” as they call it here) a few times. My friend Yolanda had already told me to check out the kids’ department — she loved the pajamas particularly. Naturally that’s what we picked up — along with a bunch of other fun back-to-school things like a hoodie sweater for Phoebe and, for Abby, a charming little T-shirt showing a dog wearing boots. Of the few we visited, we found the Monop with the best selection was in the Marais on 71 Rue Saint-Antoine. 6. Lou Pescadou – We hit this sweet bistro (16 rue Mabillon) on our first night in Paris so anything would have been perfect. Our first choice a few doors down was recommended by our local host but was closed for August. When we stumbled upon this one, we were starving and tired, having just finished 24 hours of traveling, and so needless to say, the starter plate of cornichons and saucisson and potted goose was maybe the best starter plate in the history of the world. As soon as P had a bite of the rillette we spent rest of trip searching for it at markets. 7. The Picnic Lunch Strategy We quickly realized that, much as we love sitting at sidewalk cafes, drinking Kronenbourgs and people-watching, we would be too weighted down by the inevitable richness of our lunch or end up blowing most of our daily budget by noon. 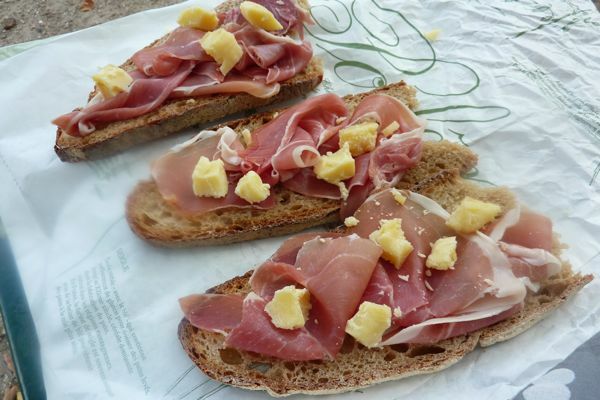 By Day Two we figured out it was much more satisfying — on every level– to put together our own lunches collecting pieces of the puzzle — baguette, jambon, Comte or chèvres, cornichons, tartlettes or some form of chocolate — as we wandered through neighborhoods. The only real planning was deciding on a park or square as an end point to give the wandering a little structure. The rest was improvised and, since we are in Paris, never once did we feel anxious about finding what we needed. 8. 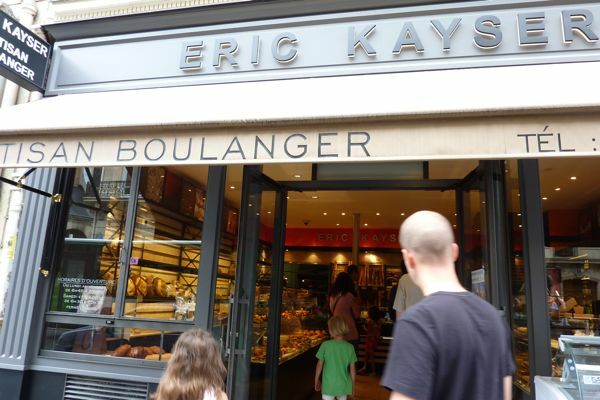 Eric Kayser – But I will say, when we started with a baguette from Eric Kayser, we knew we couldn’t go wrong. We bought two at a time for probably four days in a row and every single time they were so fresh and hot, we couldn’t put them in our bag. (For fear of melting the chocolate bien sur!) There are a few all over the city but we found ourselves at the one on Rue Monge just off Boulevard Saint-Germain. 9. 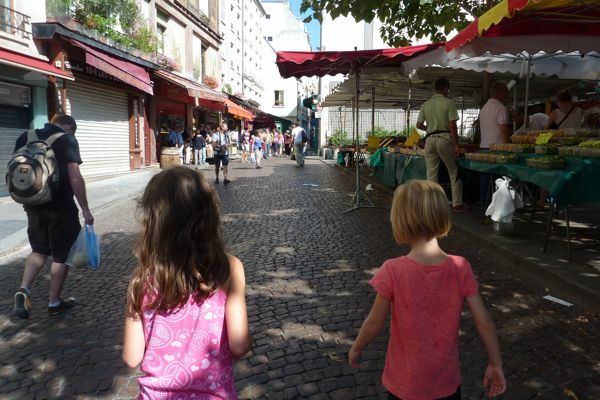 Speaking of Rue Monge just off SGB, right at that intersection is Place Maubert, which offers everything you need to complete a picnic, and in general, a life of happiness: cheese, charcuterie, fruits and vegetables. On Thursday they have an outdoor market where we found Phoebe some duck rillette (she was hoping for goose!) and me some beautiful apricots. Just down the street towards the river is Vivani square where sat on a bench and put everything together assembly line style, passing along sandwiches and yogurt and treats and then back again. 10. Le Fierbois Yogurt – This was fresh perfumy yogurt that came in charming glass bottles and sold in every flavor of the rainbow, including ruby red grapefruit, vanilla, lemon, and my personal favorite, poire. I saw them sold in almost every frommager. 11. Le Timbre – The name translates to postage stamp and that says everything about the space. Tiny. One waitress, one cool, collected British chef, Chris Wright. It was not exactly light food — I had duck with wine poached peaches — but it was definitely more refined than the bistro fare we’d been inhaling until that point. The girls had the world’s best roast chicken with mashed potatoes. Reservations required. 12. The Starters at Le Timbre – I couldn’t believe it when Abby declared she wanted to try pig’s nose paté, lightly fried and topped with pickled cabbage. 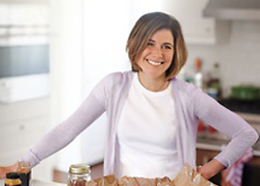 Phoebe (and her parents) were won over by toasts with caramelized onions (like majorly caramelized) and fresh anchovies. 14. Chez Janou – When you go to Paris, everyone feels compelled to send you a list of recommendations. This restaurant, in the heart of the Marais, was on about five of those lists. It didn’t change my life the way my first meal in the Marais did in 1999 (see Number 25), but it was solid, and the room itself, with its tightly packed tables, tiled walls, metallic bar, was worth the price of admission. It seemed everyone on staff spoke English. The girls ate grilled lamb kebabs, Andy had a sea bass, and I ate brandade. 15. Rue Mouffetard – This was my favorite walk of the week. We hit it on a Saturday when the old cobblestone streets were bustling with every possible vendor imaginable. It was almost too painful to stop and buy something for lunch because we were too afraid of missing out on something a few doors down. We finally settled on some smoked salmon at a fish market, crème fraiche at the Frommager Veron, a baguette at the sweetest little bakery, and some hazelnut cones at Jeff de Bruges. 16. Jeff de Bruges We stopped at these Belgian chocolate shops (all over Paris) a few times to pick up small treats for after lunch. 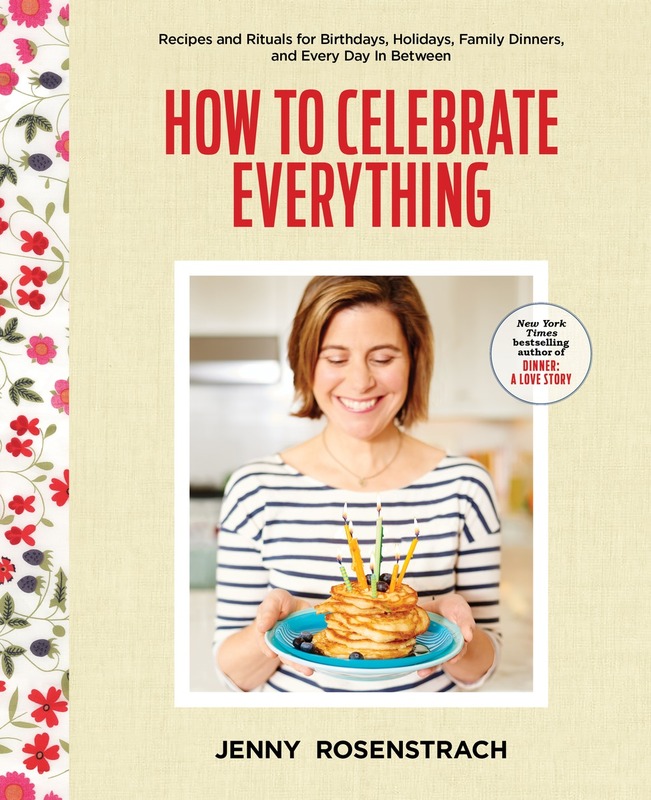 (You can’t have crepes everyday.) 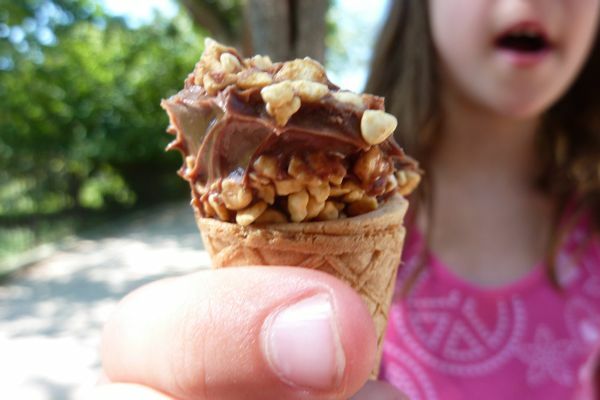 The girls favorite were these hazelnut-chocolate cones. 17. 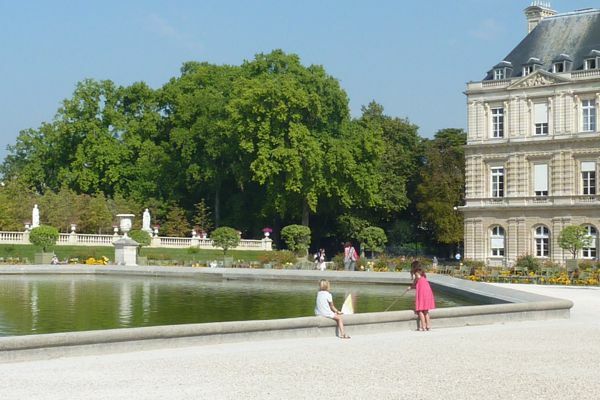 Jardin des Plantes – We ended our Mouffetard stroll here. It was a little pricey for what it was and it probably wouldn’t have been a destination in and of itself, but with rows of clean benches, a six-month-old monkey named Caspar, baby kangaroos, and a fleet of flamingos, I’d say there are worse places to stop and have a picnic lunch. 18. Parc de Buttes Charmont My roommate from college lives in the Père Lachaise area and told us that this was her favorite park in Paris. This was hard for me to hear, having fallen hard for Luxembourg Gardens. But we made the trek out to the 19th and found ourselves strolling a park with castles and waterfalls and ponds. The gardens were wilder and the grass was overgrown, but it was worth the trip. Especially since we had packed our Poilane sandwiches. 19. 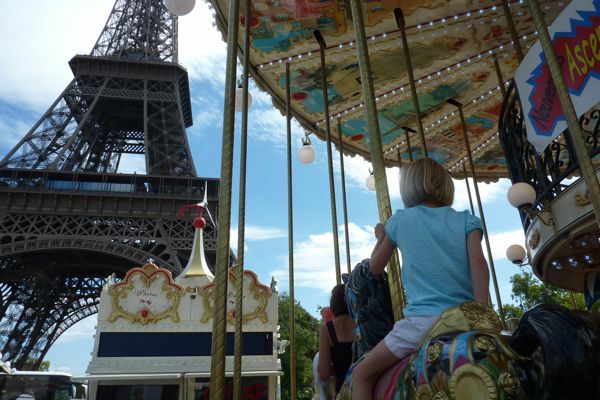 Carousel at base of Eiffel Tower (Photo is way at the top) Is it the best carousel we’ve ever been on? No. But you can’t beat the view and there’s no line, which is a sight for sore eyes after waiting an hour to climb 1200 steps. 20. One-on-One Cafe Dates The girls got along well on the trip — it helped that we added small dolls to their collection everywhere we went, which resulted in hours of pretend playtime on buses, trains, and the apartment. But by Day 5 we decided it might be good for them to take a morning off from each other. So we split up. Andy took Abby to a cafe near the gardens that she had been eyeing from the beginning (Dalloyau 2 Place Edmund Rostand) and I took Phoebe to Cafe Bonaparte (42 Rue Bonaparte) where Andy and I had lunch twelve years ago and which is right across from the oldest standing structure in Paris. When we all met up again, Abby had picked out four macarons for her sister. 21. Merci Merci (111 Boulevard Beaumarchais) This store near Place des Vosges was awesome. I wanted everything in it, right down to the red car parked in the courtyard entryway. We picked up a cutting board fashioned out of the cross section of a tree, a bunch of notebooks, and some cool up-cycled African bracelets for friends back home. 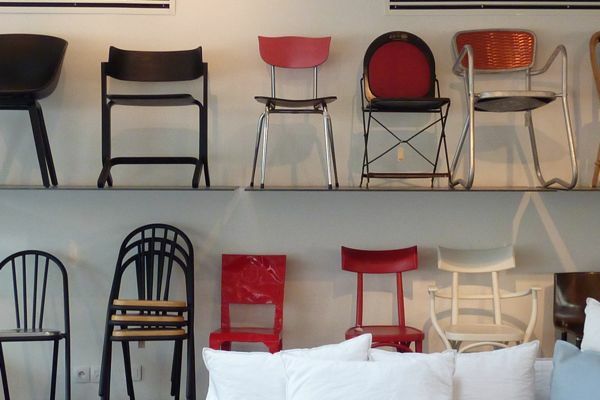 The wall of chairs in the housewares section upstairs was my favorite. 22. Place des Vosges & King Falafel (26 Rue des Rosiers). On our first day wandering through the Marais, we kept seeing people holding the most delicious looking pita sandwiches. It might have been because we had just walked a zillion miles, but I was starving, so I tried to pinpoint where they were all coming from. After passing boulanger after boulanger, we traced the mystery back to King Falafel where we ordered some schwarma, a falafel sandwich for Abby, and took our bounty to Place des Vosges, which is, of course, the most beautiful place to sit, eat, and watch other people doing the same. 23. Marché Saint-Germain – According to our friends in Paris, only a few of the vendors at this indoor market were open for August, but the ones that were (butcher, fishmonger, produce stand, Italian specialty stand) were all we needed to cook a steady stream of fresh, simple dinners. 24. The Repetto Store (in the Marais) I don’t know if this happens to all parents of girls, but it’s becoming harder and harder to convince either of my daughters to wear a skirt or a dress or anything remotely girly. So I was the only one drooling at the selection in this store. You can find their authentic ballet flats just about any high-end department store in the US now, but the store in Marais was so beautiful. If I hadn’t just bought a sundress I would have somehow justified buying the camel colored leather flats. 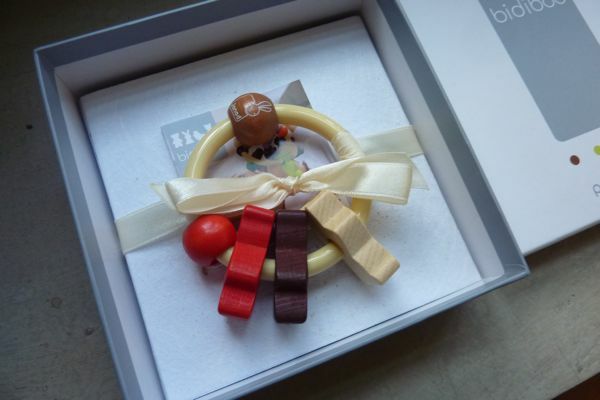 Instead, I earmarked them Number One on the 2011 Christmas List. 25. Camille (24 Rue des Francs Bourgeois) Twelve years ago, the first time I visited Paris, Andy and I walked through the Marais and ended up here for dinner. 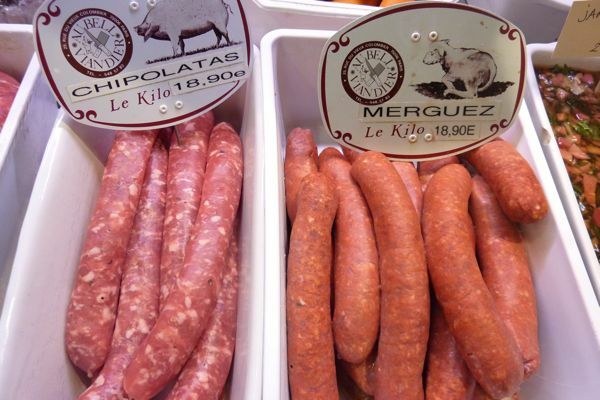 I hadn’t remembered much about it except that they hadn’t responded in English when I made the reservation in French and that we ate saucisson on warm potatoes with mustard vinaigrette (sound familiar?) that blew our minds. For old times sake, we went back for a Kronenbourg with the girls after a long day of walking. 26. Ferris Wheel at Tuileries – From what I’ve read, even the local kids get excited about the massive carnival that comes to town every summer. There are a ton of rides and we did a few of them (bumper cars, obstacle courses) but the ferris wheel was the thing we kept going back for. The view from the top (above) is stunning and neither your or your kids are bound to forget it in this lifetime. 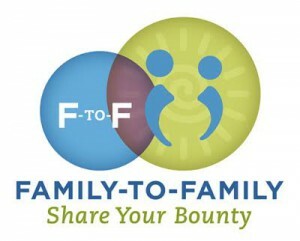 Wow – first time a blog post has made me go “but it’s not fair, I want to go”! My inner 5 year old has sophisticated tastes it seems. this is such an awesome list. now if I could only figure out how to get there! wow, we are going to Paris with our kids (twins, 8 yrs old) tomorrow! so thanks for the post, most helpful. I’m so excited….We also were inspired by your reading program idea, and did that with the kids too. It was really a fabulous idea! What a great list. I hope the girls enjoyed themselves. I hear you about how the magic days in Paris are the ones spent wandering the neighborhoods. We joked that it wouldn’t be a Paris museum if we didn’t see kids crying their eyes out. I love your list and enjoyed so many of the things you chose when we were there this summer. Yes to Jardin Luxembourg!!! Yes to the Parc de Buttes Chaumant!!! And of course, yes to Poilane. Thanks for bringing back more memories. Your list really brings back great memories! I took my 5 year old (along with a very pregnant wife) about 5 years ago and had an amazing trip! You’re right … the carnival at Tuileries was by far is favorite thing to do. Next was drinking hot chocolate that was so thick you could eat it with a fork! Ah, Paris. Thanks for the great post. Thank you so much for this post!! Taking our 3.5 year old next spring and I wanted to ask a random question. Do young children ever have digestive issues with the dairy in France? We want him to try the cheese, yogurt etc but I don’t know the risks issues of unpasteurized dairy. Any tips? we had a paris get-away with our girls this summer too. and the ferris wheel topped their list 🙂 it was a quick visit for us – and i’ll be adding your tips to my list for our return. can’t wait. we leave for Berlin and Paris on Saturday with our 3.5 year old and 9 month old, thanks so much for the wonderful list! 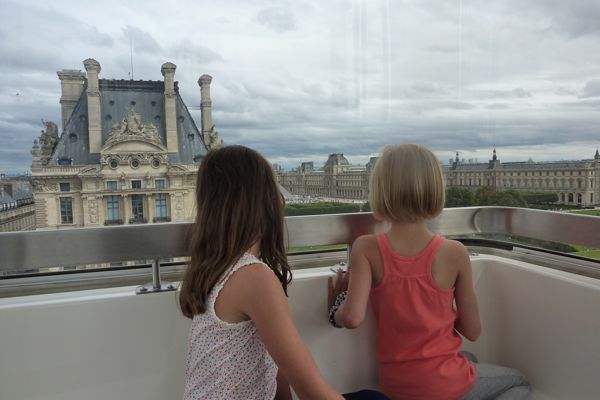 We’re planning a trip with our 2 daughters next summer and I really enjoyed your post. It’s making me reconsider the amount of time we will spend there. We were thinking 5 nights in Paris to be able to see Provence as well, but a longer stay in Paris seems much more relaxing with kids! Thank you for your recommendations. I’ll save them for next summer. Would you recommend the apartment you stayed in? (Forgive me if you posted about it on another day; I’ve only read this one entry! ).